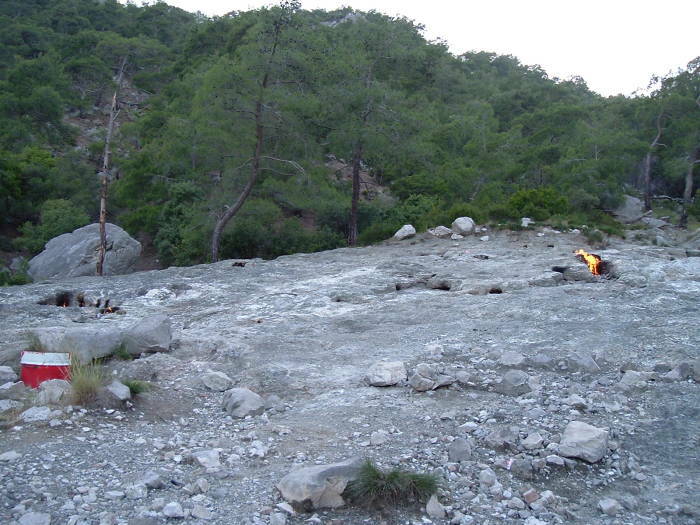 A mountain along the Mediterranean coast of Turkey has an area of permanent gas vents which spontaneously burn. It was used as a navigational reference and inspired ancient myths. 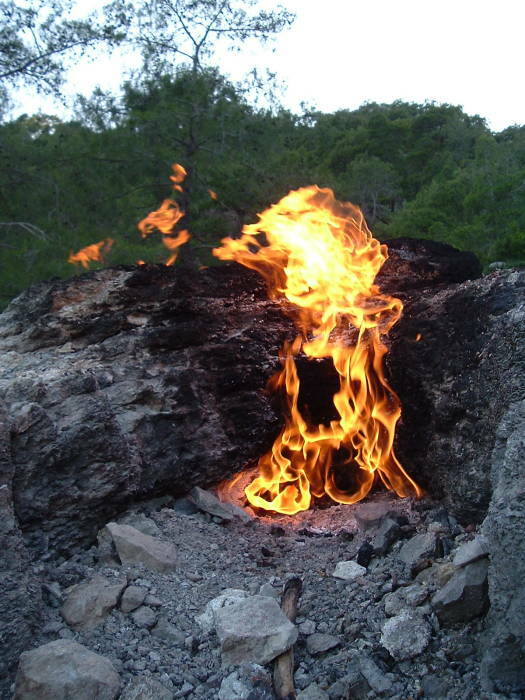 The Greeks called it the Χίμαιρα (or Chimera), the Turkish name is Yanar taş, meaning flaming rock. 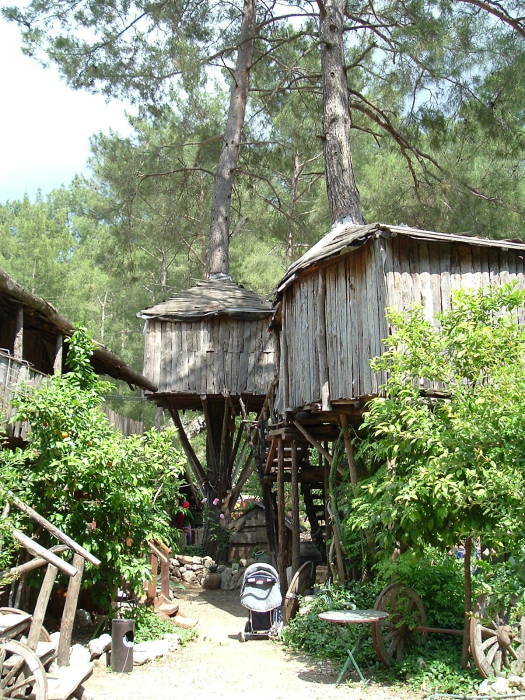 You can live in a treehouse near the ancient Greek city of Olympos. Visit the ruins, relax on the beach, and visit the burning mountain. So what's the name? Olympos? Olimpos? Well, it depends on who you ask! The name comes from the Greek settlement. Being Greek, of course they used the Greek alphabet and spelled it Ολυμπος. 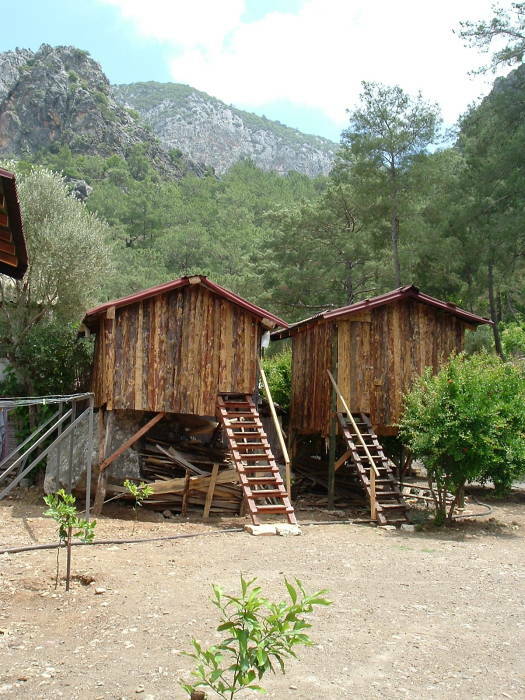 English speakers usually spell that Olympos, but the Turks spell it as Olimpos. This is like the spelling difference between Istanbul, as generally seen in English text, and İstanbul, as it's actually spelled. (see the dot?) Or Cappadocia versus Kapadokya. Lonely Planet tries to discourage people from visiting. 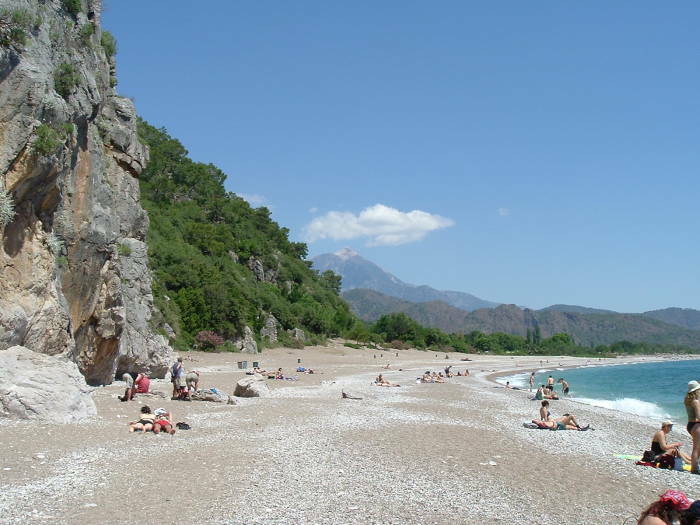 Who knows — it may be because Olympos is a very popular holiday spot for Turks, and the publishers are trying to keep foreign visitors from overwhelming the place. 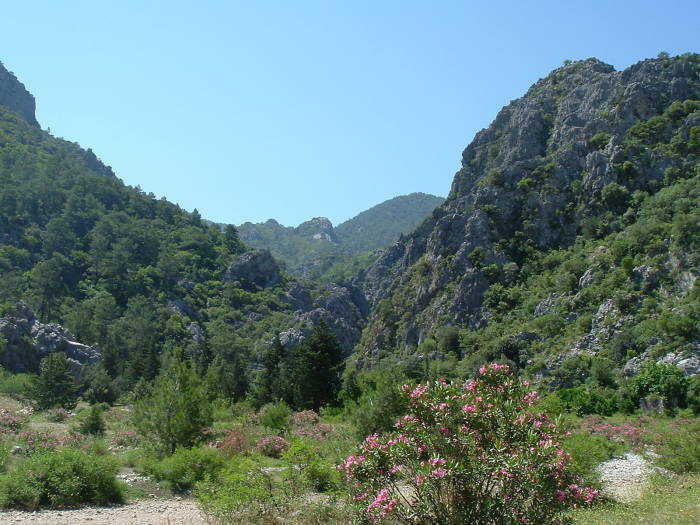 There were over 20 mountains named "Olympos" in the classical world. 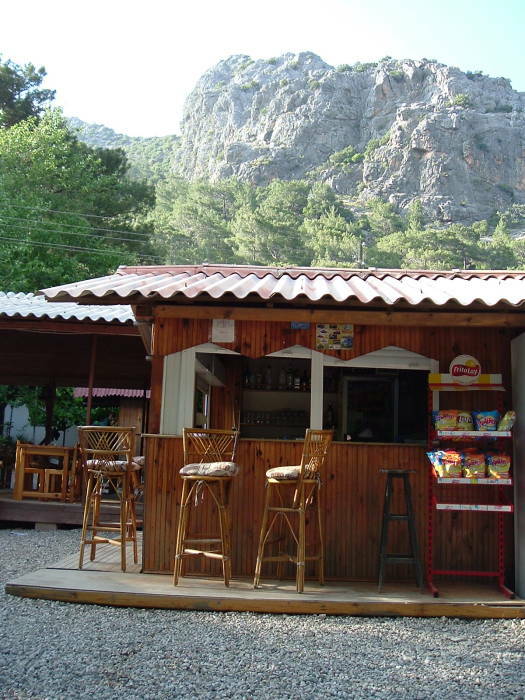 Olympos is down the coast from Antalya. 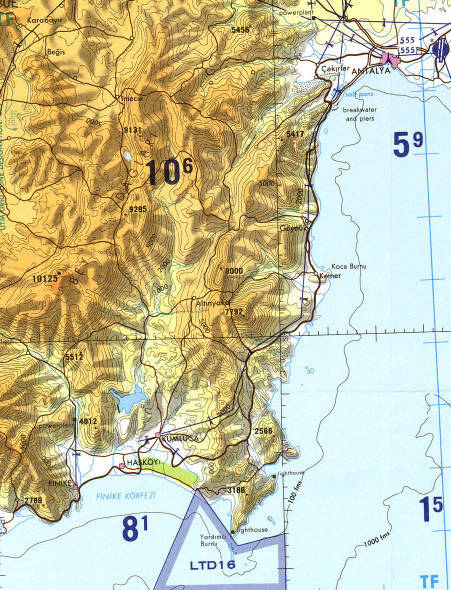 The highway follows the coastline most of the way to Kemer. South of Kemer, the highway climbs inland. 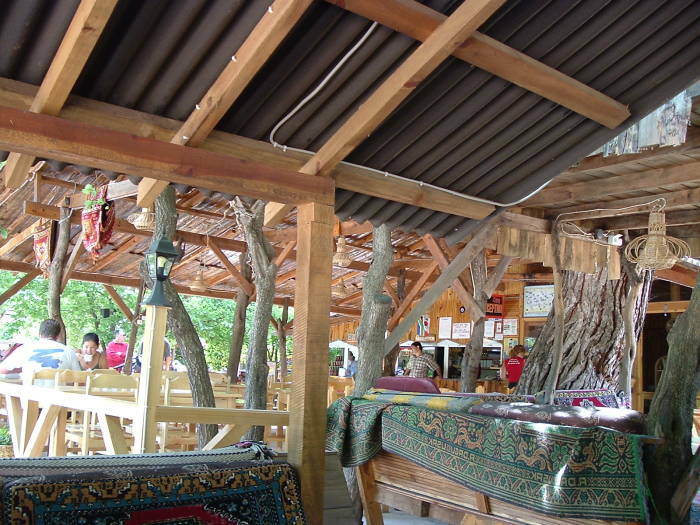 To get there, you take a minibus from Antalya to a tea house along the highway, where you wait for a shuttle van down into the valley of Olympos. 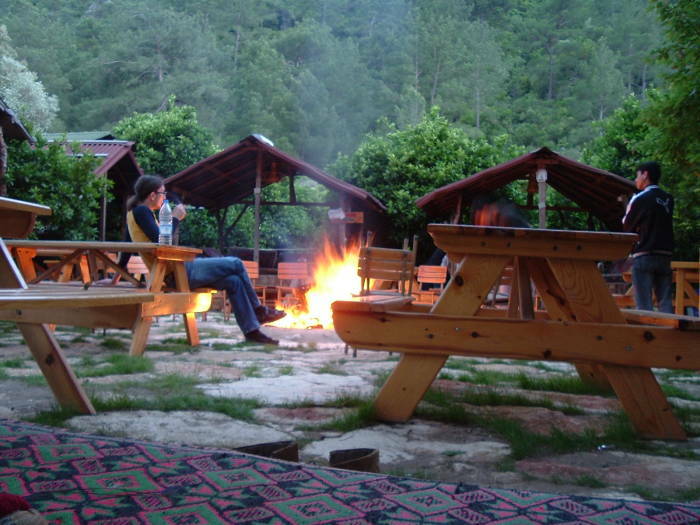 As for a minibus to Olympos at the Antalya otogar. They will leave every 30 to 60 minutes, and will take about 90 minutes. 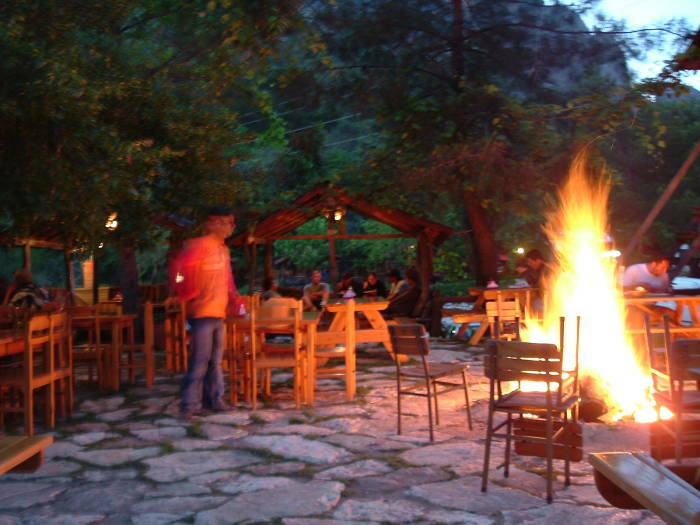 Allow adequate time to reach Olympos before dark. The minibus will drop you at a roadside tea-house. Well, really a tea-tent. If you arrived early enough, have some tea or something else to drink at the tea-house and wait for a shuttle van from the valley. If you arrived too late and the shuttle van is no longer running, then when enough people gather you can hire someone at the tea-house to take you down into the valley. Don't try walking from the tea-house! It's several kilometers down a steep and twisting road. 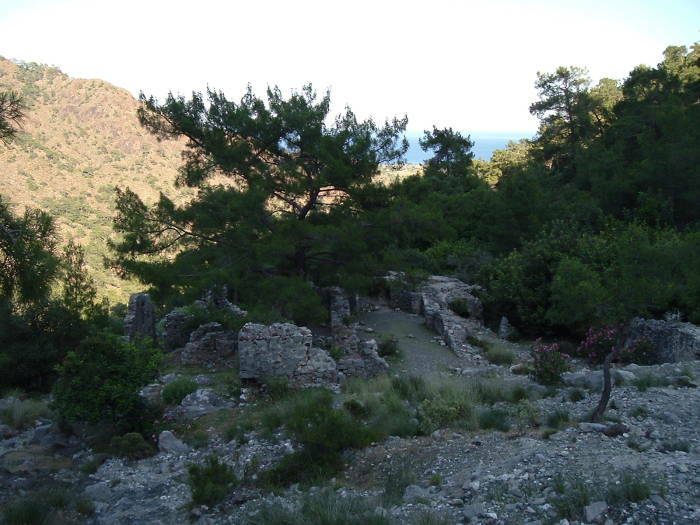 Explore the ruins of Olympos and trails into the surrounding mountains. 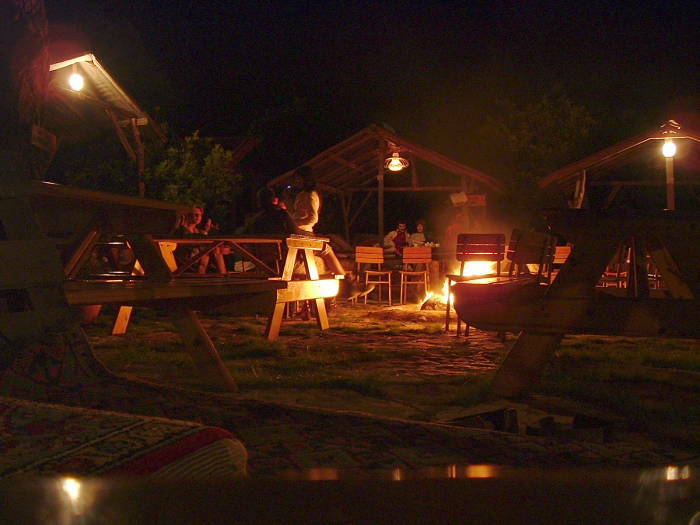 Hang out by the campfires in the evenings. Trek to see the Chimera, the bizarre rock formation on a nearby mountain where natural gas seeps from the rock and spontaneously combusts. Some camps have proper tree-houses. 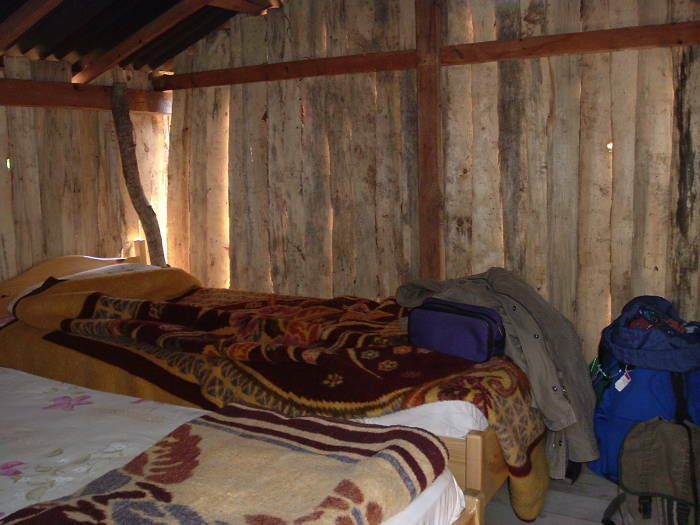 Other camps have elevated cabins. All have nice accommodations. Many have gone from the perfectly adequate foam pads of past years to regular beds and mattresses. They have nice platforms where you get breakfast and dinner. Both are included at most camps, and you're only looking at maybe US$ 10 for your bed and two meals a day. During the day or late at night you can get snacks, light meals, and drinks. Or use the Internet, or listen to all sorts of music, or browse the collection of books to trade, or just hang out. Now dinner is about ready, and the campfire is started. Is that enough fire, or do we need more fuel? Hanging out around the campfire. Trading stories, making plans for the next day. It's time to go to bed. Tomorrow will be another busy day. 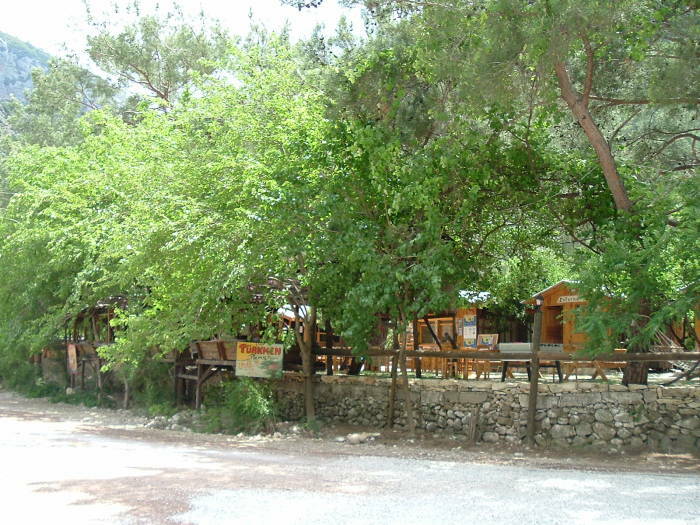 Olympos was founded in the Hellenistic period, and was one of the leading cities in the Lycian federation. Cicero described it in Against Verres as an ancient city full of riches and works of art. Coins minted there date back to the 2nd century BC. Inscriptions on a wall and a sarcophagus date back to the late 4th century BC. According to Homer's Odyssey, this is where the god Poseidon looked out to sea and saw Odysseus sailing away from Calypso's island. Poseidon then called up a storm that wrecked Odysseus' ship on the island of Nausicaa. 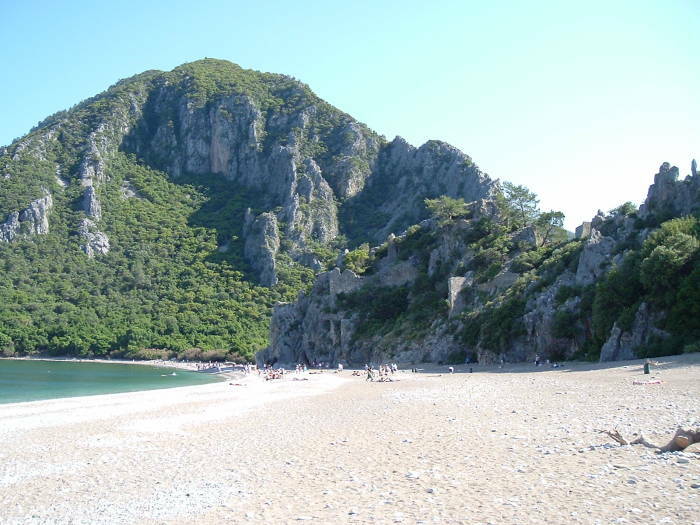 In the 1st century BC, Olympos was invaded and settled by Cilician pirates. In 78 AD, the Roman commander Servilius Isaurieus captured the city and added it to the Roman Empire. The Roman emperor Hadrian later visited the city, and it took on the name Hadrianopolis for a while in his honor. 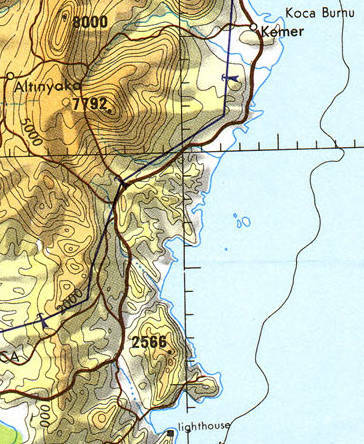 Olympos became a Christian diocese associated with Myra, the capital of the Roman province of Lycia. Its earliest recorded bishop was Methodius, who served from the late 200s until his martyrdom in 311. Later bishops included Aristocritus, who took part in the Council of Ephesus in 431 and the Council of Chalcedon in 451. In the Middle Ages, the Venetians, Genoese, and Rhodians built two fortresses along the coast. 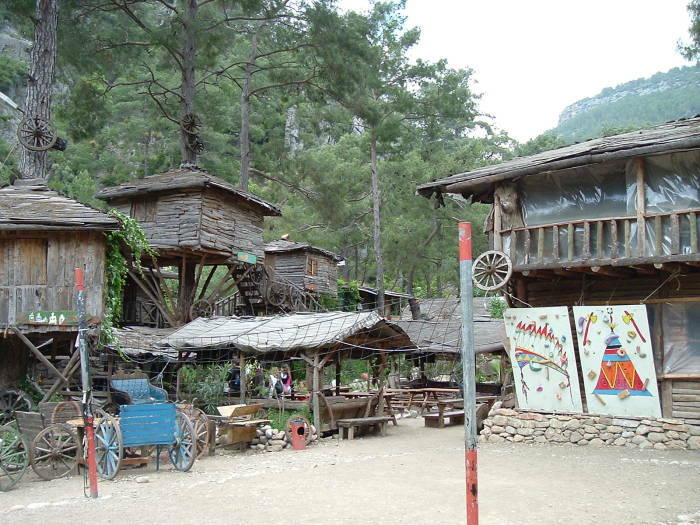 By the 15th century, Olympos had been abandoned. The valley is narrow with steep sides. Trails lead back into the side valleys and into the hills. You need to buy a park ticket at the parking lot at the end of the lane past the camps. Hang onto it, you can use it for a week. 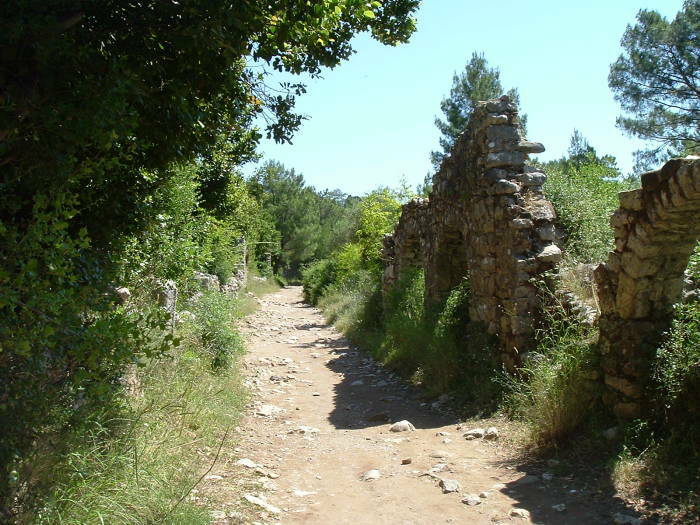 A main path leads through the ruins of the ancient settlement of Olympos. The path leads through the site of the ancient city and to the beach. 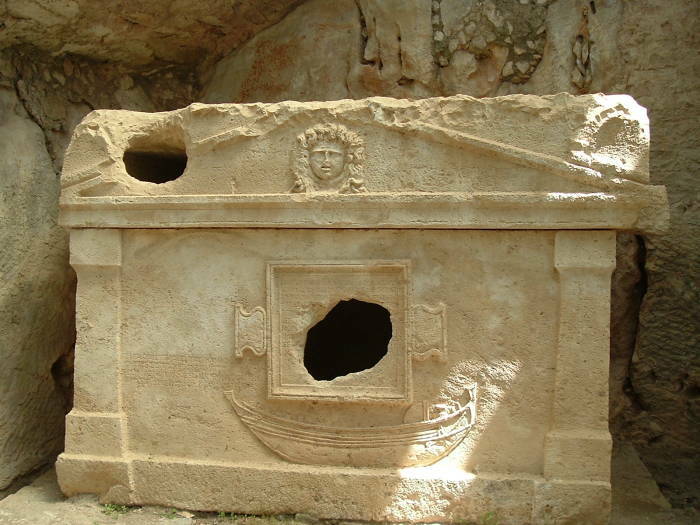 This is the sarcophagus of Captain Eudemos. There are some good climbing routes and bouldering problems along the rock face here. You can meet lots of local climbers to join. Or, you can just hang out on the beach. There are big crowds on some days! A multi-day trip on a gület or Turkish yacht often stops at Olympos as it goes around what's called the "Turquoise coast". And yes, the color of the water here along the Turkish coast is where the word "turquoise" comes from. We're looking back along the beach. The valley leading back to Olympos goes back to the right on this side of the larger hill, where the beach curves to our left. Here is a panorama looking down over the bay from the ruins of a fortress. It's not a very good picture — a scan of two prints taken with a very cheap camera — but it shows a lot of the landscape. The ruins of the ancient city of Olympos are off to the left, back the valley where you see the stream crossing the beach near the sailboat. 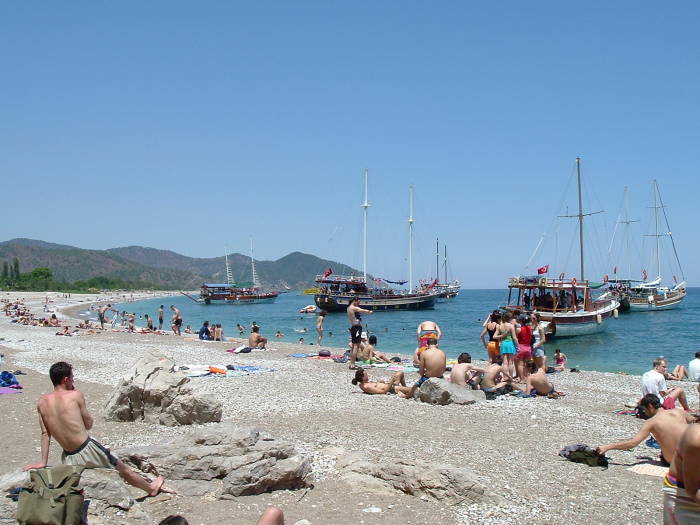 Yanar Taş, or the Chimera, the burning mountain, is off to the north (right), along the beach past the village of Çıralı. The Greek name is the Ολυμπος (or Chimera). 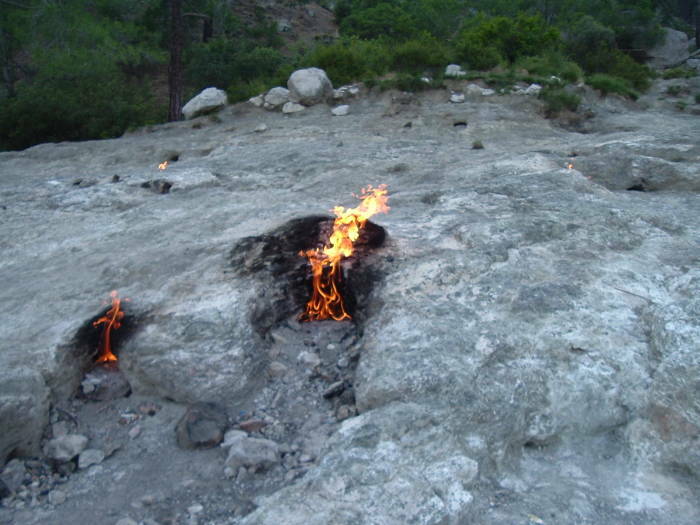 The Turkish name is Yanar taş, meaning flaming rock. Or, you also see Yanartaş. 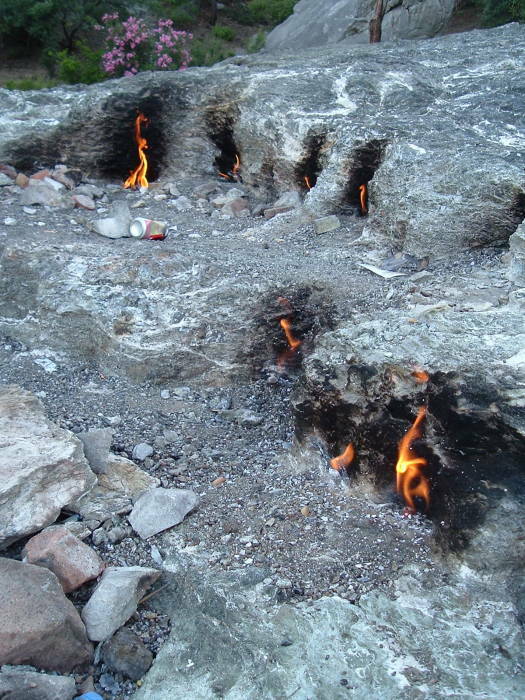 There is an area of permanent gas vents, emitting a mixture of flammible hydrocarbons. 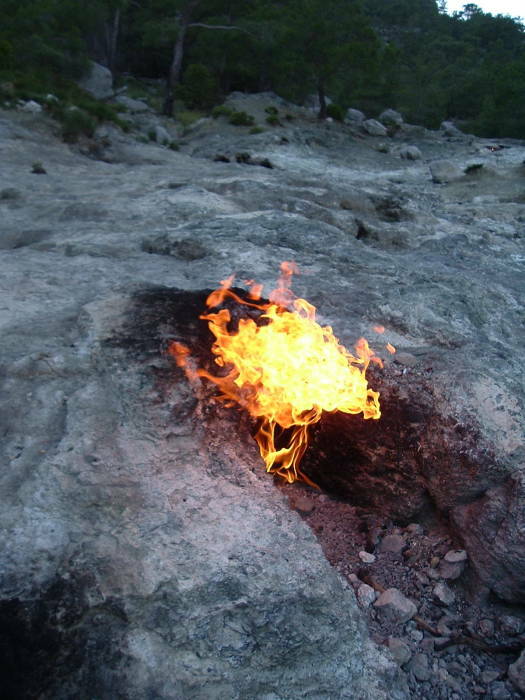 The gas seep covers an area of about 5000 square meters, and it has been burning for over 2,500 years. trace amounts of argon, helium, neon, and heavier hydrocarbons. The two largest flames are typically about 60 and 50 cm high, representing gas fluxes of over 30 and 15 kg of gas per day, respectively. Pliny the Elder described it in his Historia Naturalis. See 2.110, where he cites Ctesias of Cnidos. Some speculate that it was the inspiration for the fire-breathing Chimera in Homer's Illiad. English historians identified this site as the classic Mount Chimaera in the 1800s, starting with Sir Francis Beaufort in 1811. Thomas Abel Brimage Spratt described it in his 1847 book Travels in Lycia, Milyas, and the Cibyratis, in company with the late Rev. E. T. Daniell. In ancient times it was used as a navigational reference. 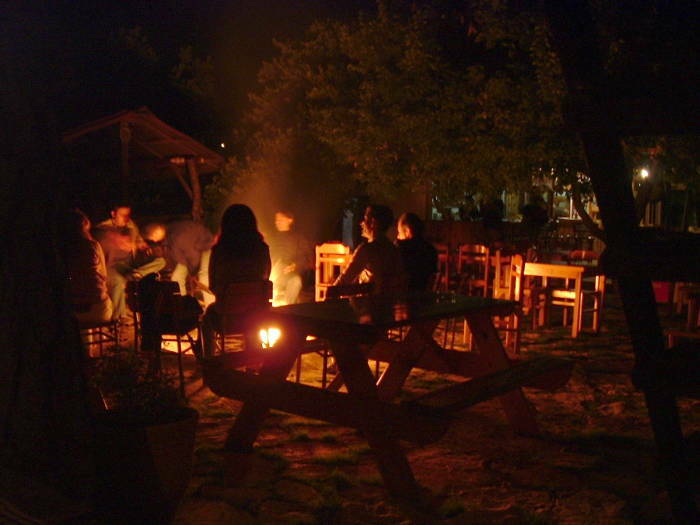 3.5 km from Çıralı to the Chimera. Or, you can go on the nightly van trip for just a few Euros. 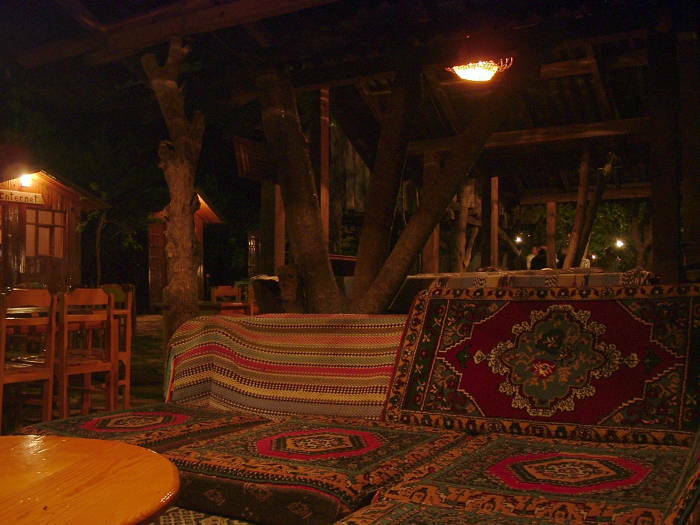 My recommendation: If you have any sense, you will be staying at Olympos for several days. So, walk to see it during the day and take the van to see it at night! When you first arrive, you see a large white stone area on the hillside. Large flames, small flames, there's a variety. As you might imagine, this has been well known as a freaky place for many centuries. Back in early days it had a shrine to Hephastus, the god of fire (of course). Also known as Vulcan, the god of industrial rubber production and logic. Then in early Christian days the Hephastion was converted into a church — see the ruins below, at the bottom edge of the fire area. That's the Mediterranean in the distance. Centuries ago, when there was very little man-made light at night, the Chimera served as a navigational aid. People still pray here. These ribbons bear the subjects of prayers. 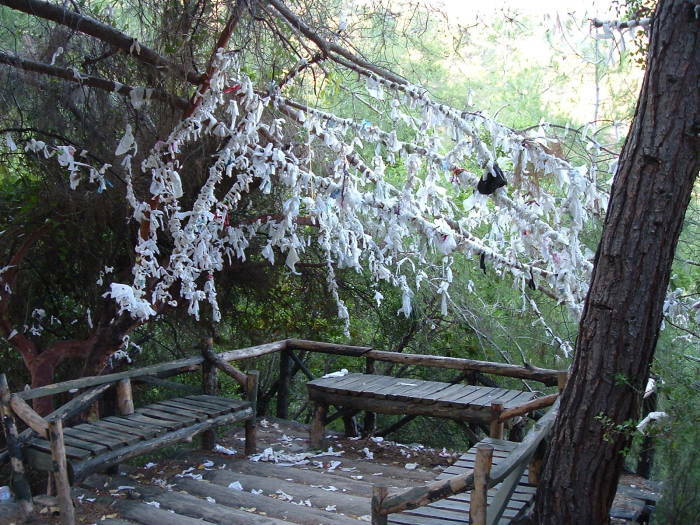 Also see the Cave of the Seven Sleepers near Ephesus, and Maryemana, the Virgin Mary's house, for other places you see prayer ribbons. How do you use a Turkish toilet?